Greetings to expats and global minds! We are excited to invite you to the InterNations Official Event taking place at NIFTY No. 20, the bar of Hotel Puro. Part of the venue will be exclusively reserved for InterNations and every attendee will receive a free welcome drink and also discount at the bar all the evening. Come enjoy the great surroundings and generate some new contacts. 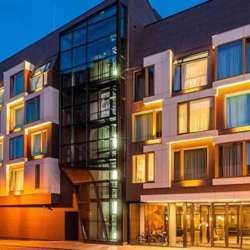 Puro is a comfortable, spacious, and superbly presented modern hotel that exists near to the heart of Poznań. If you're new to InterNations or in town, don’t hesitate to come alone, just inform us upon check-in. Kindly remember to register for the event by clicking the Accept Invitation button. Feel free to bring your international friends and don't forget to invite them to sign up to InterNations as well! For administrative purposes, the guest list will close 2 hours before the event starts. However, do feel free to join the event, even if you missed the sign-up deadline.